I’m a big beer drinker and I love trying new beers. Local is good but not required. I usually go for ambers, reds, pilsners and pale ales, but recently, I’ve been obsessed with an IRA (India Red Ale), which is strange for me. I’m not a big fan of hops, but I am a fan of red beers so this seems to have hit it perfectly. 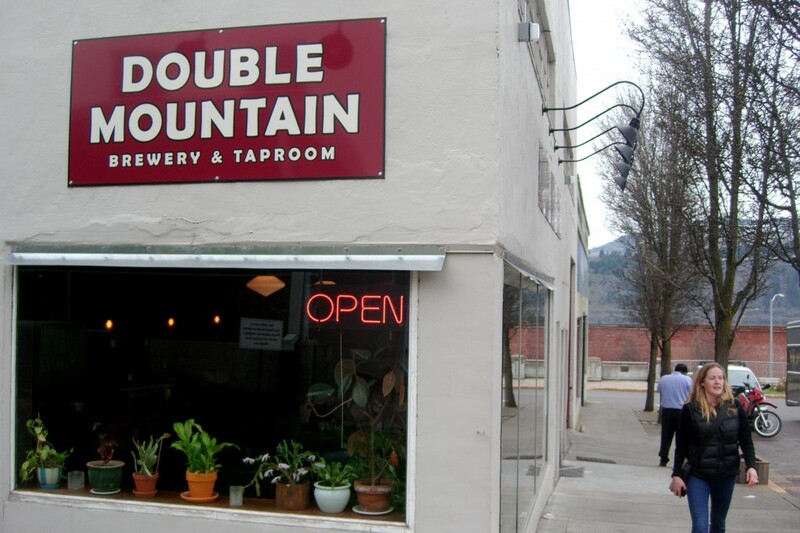 Plus, it comes from a Double Mountain Brewery right up the river, in Hood River. So, of course, we drove out for a visit. Hood River is also the home of Full Sail, which makes a nice Amber, but I’ve always hated their packaging, so I never really drink or buy it (graphic design matters!). But if you are in Hood River, they do have a beautiful tasting room especially on a sunny day. It’s about two blocks away from Double Mountain, which is what we’re here to talk about. We got to Double Mountain on a Friday afternoon around 3pm and found it PACKED. We had to squeeze in at the bar because all the tables were full. It’s a small place to begin with, but the crowd really surprised us. We also immediately noticed that everybody in there was eating pizza. One glance at the menu and it became clear: they have a killer happy hour! 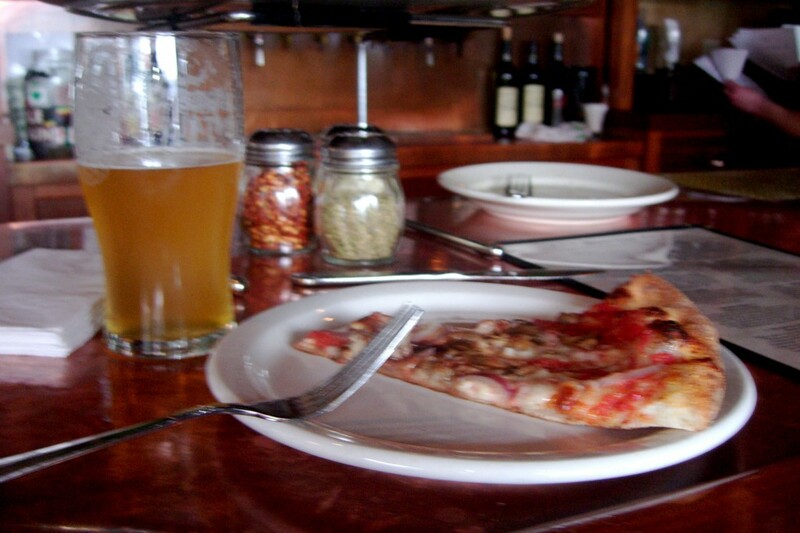 HALF PRICE PIZZA until 4pm on weekdays. So we ordered up a pie and a couple pints. I tried a Kolsch, in honor of my dear friend, Gloria. (Gloria: it was only ok, had a funny aftertaste.) They only have a couple year-round beers, and lots of specials including something I’ve never heard of before, a beer Trilogy. During out visit they were serving beers one and two and making the third. They also had a Kriek, which is a Cherry Beer that I wish I had tried. Overall, it was a great little place, making really innovative and creative brews. If you’re in Hood River or see their beer on a tap (they don’t bottle yet, so it’s your only option) in Portland give them a try. Thanks Kristi! Sorry it wasn’t amazing, I tried it last summer when we were there and had the same feeling. Oh how I miss the Kolsch at Roots! I keep asking myself why they had to close RIGHT AFTER I found that they had the most delicious one. I am still on the hunt for another great one!